There's nothing like a huge, diverse nation with a tumultuous history to bring on the weirdness. 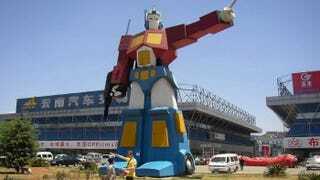 Here are a few of our favorite incredibly strange monuments that could only exist in China . . . or maybe the American midwest. But we'll save the latter for another day. For now, enjoy this gallery of eastern oddities. The 100m long and 5m tall waterfall is made from thousands of toilet seats, sinks and urinals. Bi Heng, a Chinese arts student, made this 2 ton weigh and almost 10 m tall robot. The materials came from an old Chinese military vehicle, the Jiefang CA10. This 157 m tall ring is made from 3000 tons of steel, and decorated with 12,000 LED lights. Because why not? In the border town between Mongolia and China there are two Brontosauruses are kissing above the highway. Designed by Luo Xu and erected in 2012. About time this humble piece of technology got its own statue. The 12 m high sculpture welcomes truck factory laborers to work.